Getting ready to head back to college?.....Of course you are! Who's not thinking about schoolwork and exams in early August? Just kidding, I know you're probably trying to put off that kind of thinking for as long as possible -- but you still need to start getting everything ready to go. 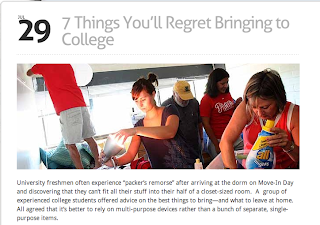 So before you begin the fury that is packing for college, take a second and check out this great list of "7 Things You'll Regret Bringing to College" (especially you incoming Freshmen). Though I don't particularly agree with leaving your alarm clock home in favor of your cell phone (mainly because cell phones mysteriously forget to plug themselves in and die), there is plenty I do agree with. For example nearly the entire "Don't Leave Home Without It" section......besides the multivitamins -- nasty! !